Add length, thickness and volume to your hair with our stunning Mahogany - Intense Red, triple weft, full head clip in hair extensions. 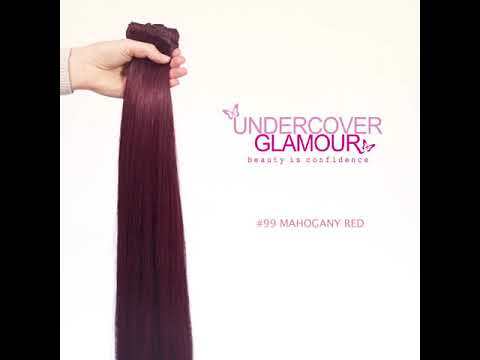 Our Mahogany hair colour will suit those that have dyed their hair a Dark Cherry Red, Mahogany this colour is also described as a Deep Burgundy. 100% REMY human hair for beautiful glossy hair. Silky soft - 100% remy hair. Perfect for everyday hair styles and for glamming up for the evening. Just looking for a little extra volume? Try our #99j Individual, Triple Weft Hair Pieces.